iPhone 5 Due in Q3, 4-Inch Screen, Metal Chassis? China Times reports (via GadgetsDNA) that the iPhone 5 has entered trial production and is due for production in the 3rd Quarter of this year. Other details from the Chinese newspaper seem to echo previous rumors that the new iPhone 5 will have a metal chassis to improve antenna sensitivity as well as a 4-inch touch screen. Many of the rumors so far seem to be pointing to an iPhone 4-like frame for the new iPhone 5. 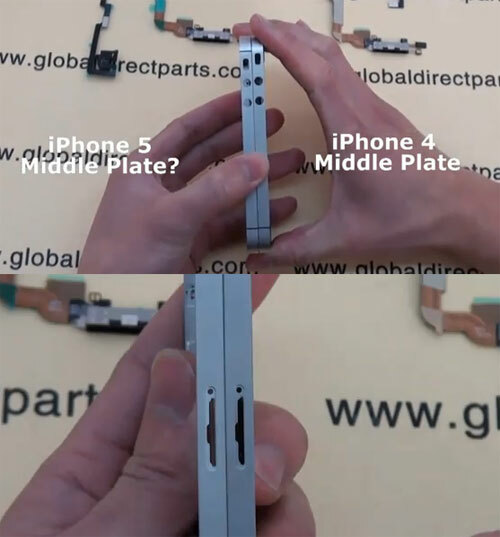 Looking back at old rumors, an iPhone 5 parts video that surfaced back in January may have actually been an early look at the iPhone 5 casing (photo above). That video actually first revealed the new antenna dividers found on the Verizon iPhone, but also included a SIM card slot that does not appear in the Verizon iPhone. It's believed that the iPhone 5 may support both CDMA and GSM networks in one phone. The Verizon iPhone has already been found to use a Qualcomm chip that can support both networks.